Thanks for attending! The slides of our presenters are going to be available here shortly. 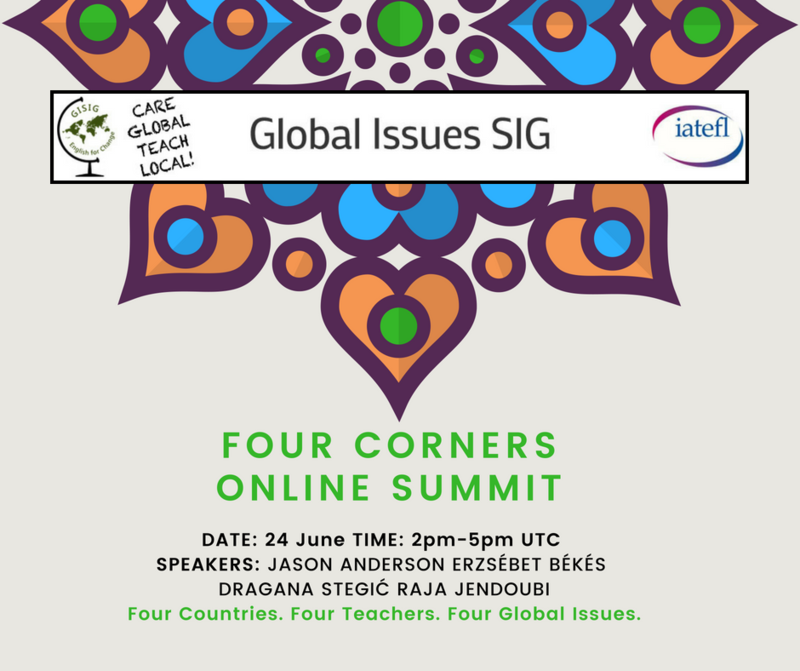 In this webinar organised by IATEFL Global Issues SIG, four teachers from four countries share their experience of how they tackle global issues in the classroom. Over the past couple of years this has been a challenge for me in the Ecuadorian context where I work. My aim was to bridge the gap: not just between theory and practice, but between the reality of the classroom and the outside world. My students have reached out systematically and, in the process, have been exposed not just to a rich variety of Englishes, but gained insights into how learners and educators deal with the challenges in less developed parts of the world. I will take you on a journey through my most recent experiences hoping that some of the activities we have created could be transposed and used under similar circumstances. Erzsébet Békés is a Hungarian English teacher with more than 40 years of ELT experience. As a volunteer, she taught English to North African migrants in Crete, set up Language Improvement Centres in Ethiopia, spent six months teaching English for Tourism to members of an indigenous tribe in the Amazonian jungle and gave crash courses in Survival English to nomadic ‘sea gypsies’ while visiting Borneo. Based in Ecuador and working as a teacher trainer, she is a fully competent and proud non-native speaker teacher of English. In this session I will explore how teachers who work in low-resource classrooms and with large classes can be empowered, rather than disempowered, through teacher education programs. Many programs and courses for English language teachers around the world today tend towards top-down ‘training’ rather than developmental approaches to in-service teacher education. Instead of valuing and building on who we are as teachers, these courses often attempt to import alien methodology, undermine our values, and – as a result – disempower us as teachers. We will look at ways we can recognise, value and prioritise the knowledge, skills and awareness of teacher-participants, while providing access to the course content and ideas. This is particularly important in low-resource contexts where educators’ prior experience and course content may be very different to the realities of the teacher-participants. Jason Anderson is a teacher, teacher educator and award-winning author of books for language teachers. He has taught languages, trained teachers, and developed materials to support teachers in primary, secondary, and tertiary contexts in numerous countries across Africa, Asia and Europe. He has worked for national ministries of education and development partners including UNICEF, the British Council and VSO. His interests include pre-service and in-service teacher education, multilingualism in language teaching and issues of appropriacy of methodology and social context, especially in low-income countries. In my talk I will try to provide some insight into how exactly the breakup of Yugoslavia affected people living here and examine the struggles we still face 22 years after the conflict ended. I will speak about the challenges teachers face in and outside the classroom and of a project initiated by IATEFL Slovenia in order to help teaching associations in the region work closely together. Dragana Stegić is an English language teacher based in Ljubljana, Slovenia. Her main interests include global issues and incorporating critical thinking into foreign language teaching. She is an active member of IATEFL Slovenia and a coordinator for ABELTA (Alliance of Balkan English Language Teaching Associations). On this project Dragana is working closely with teachers from the region to empower them to collaborate. Tunisia: Think globally, act locally! Involving our students in projects in the local community and incorporating kindness and gratitude in their English lessons is beneficial to everyone involved. In my session I will talk about the importance of engaging students in the community, drawing on my work with students of culinary arts at the Institut des Hautes Etudes Touristique in Sidi Bousaid, Tunis. One of these projects involved preparing a meal for 150 residents of a nursing home. Another recent event I organized was the refurbishing of an old space in the Institute and launching “un cafe’ culturel” where students can organize concerts, watch movies (cine club) and perform plays in Italian, German, Russian, English and Chinese with the help of their teachers. Raja Jendoubi is a certified senior English head teacher graduated from the University of Arts and Human Sciences of Tunis. She has 25 years experience as an ELT and ESP teacher; in the 90s at King Saud University, Riyadh, KSA and more recently as an ACCESS teacher. She also coaches young graduates for the Tunisian Ministry of Education. Raja currently teaches at the L’Institut Superieur de Tourisme in Tunis. Raja loves travelling, recycling, hiking and gardening and enjoys making fresh lemonade with lemons from her lemon tree. She is passionate about raising her students’ awareness of the possible threats to the quality of their lives and encourages them to nurture and respect their environment and community. She is also a strong advocate of women’s rights. ‘Voices from Africa’ competition – Winners! Can I join although I am not a member of GISIG? In complementing Raja’s >Tunisia: Think globally, act locally!<, a very striking 25-min film from far southeastern Tunisia, the ancient port city of Zarzis (in antiquity Gergis), about an unusual self-taught artist Mohsen Lihidheb using waste to create beautiful but simple installations. Also shaping a unique museum that schoolchildren visit and are inspired by. Students will enjoy and profit from, and also very relevant to environmental awareness and how to use the seashore waste for beauty. Learners can dream up similar projects where they live. All the best to our four presenters on the after-cusp of summer solstice north, winter solstice south. The article is from VOA (Sept. 17, 2018) but is perhaps grounded in some contact with and knowledge of realities in the Western Balkans.